After a tough five-set loss to Ball State in the Mid-American Conference opener Friday, the Northern Illinois volleyball team bounced back in a big way Saturday night at Victor E. Court. The Huskies swept Toledo, 25-15, 25-22, 25-19, to split their conference home weekend. “As a group, we knew that last night’s loss was a tough one,” said NIU head coach Ray Gooden. “But the good thing about tonight is we had a chance to have a short memory and make up for what we didn’t accomplish the night before. 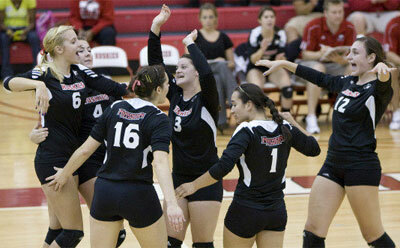 NIU (15-2, 1-1 MAC) was in control for the entire match, as there were only three lead changes all night. The first two came in the initial set. After the Huskies were up 2-1, Toledo (5-8, 1-1 MAC) scored on a kill, Huskie attack error and block. The teams then exchanged points before NIU broke the 4-4 tie with a 9-2 run behind freshman outside hitter Lauren Wicinski’s (Geneva, Ill./Geneva) serving. In serving for the whole run, Wicinski put down three aces and made the Rocket back row passers very uncomfortable. With momentum on their side, the Huskies were able easily take the set. The final lead change happened in the second set. NIU was aced on the first serve but scored three straight points, two from Wicinski kills, to take control again. From there, NIU grabbed a four-point lead three different times but the Rockets hung close, climbing within one point after another ace late in the set. But sophomore outside hitter Meghan Romo (Valparaiso, Ind./Valparaiso) answered with a kill to put the Huskies up 23-21. A Toledo kill later, junior outside hitter Allison McGlaughlin (Morton, Ill./Morton) fired back with a kill, and an errant Rocket attack gave NIU the 2-0 advantage in the match. In the final stanza, NIU charged out to a 5-1 lead with help from three Wicinski putaways. Toledo rallied back to knot the score at 12-12 but the Huskies quickly got rolling again with an 8-2 spurt, and didn’t look back. Wicinski once again sparked the run as she scored the first three points with back-to-back kills and a block. As a team, the Huskies racked up 40 kills and a .299 hitting percentage, along with 35 digs and nine blocks, scoring 57 points. Toledo’s line: 31 kills, .136 hitting percentage, 31 digs, four blocks, 39 points. Wicinski led the way for NIU with 19 kills and hit .441. Romo also achieved double-digit kills with 10 and a .444 attack percentage, along with a season-high-tying four blocks for the second straight match. McGlaughlin was most efficient in putting up a season-best .583 hitting percentage, totaling eight kills. Junior setter Kristin Hoffman (Batavia, Ill./Batavia) ran the offense well with 37 assists, while senior libero Maddie Hughes (St. Charles, Ill./North) captained the defense with 15 digs, marking the fourth straight match that she has had 10 or more digs. With one contest remaining on their season-long, seven-match home stand, the Huskies improved to 4-2 on the stretch. NIU also bettered to 9-2 at home this year and 37-30 at Victor E. Court against MAC foes since 2002. The Huskies return to action at 7 p.m. Thursday, Sept. 30, as they host Western Michigan (11-4, 2-0 MAC).